If you follow me on Twitter (cough…shameless plug…cough), you know that I recently spent a day in Switzerland, swimming in the Rhine. Or floating in the Rhine. Whatever. There was some kicking involved, so it totally counts. Have you done this? You should do this. It was heavenly to drift down the river, and so interesting – and slightly surreal – to be surrounded by so much history and culture. You’ve never seen a cathedral until you’re floating on your back and one suddenly looms above you. And I wanted to know more. Apparently I didn’t shut up for the full 30 minutes. How old is that ridiculously tall, skinny building? That sculpture on that bridge – who is it? What just touched my leg? What fish live in in the river? Will any of them eat me? How long have people lived along this section of the Rhine? What are those funny boats? Why do I hear bagpipes? What role has the river played in Basel’s history? Seriously, what just touched my leg?!? As soon as we got out I wanted to go in again – there was still a whole riverbank I hadn’t looked at. And so I began to wonder: what could a swimming tour of the Rhine look like? A giant audience. 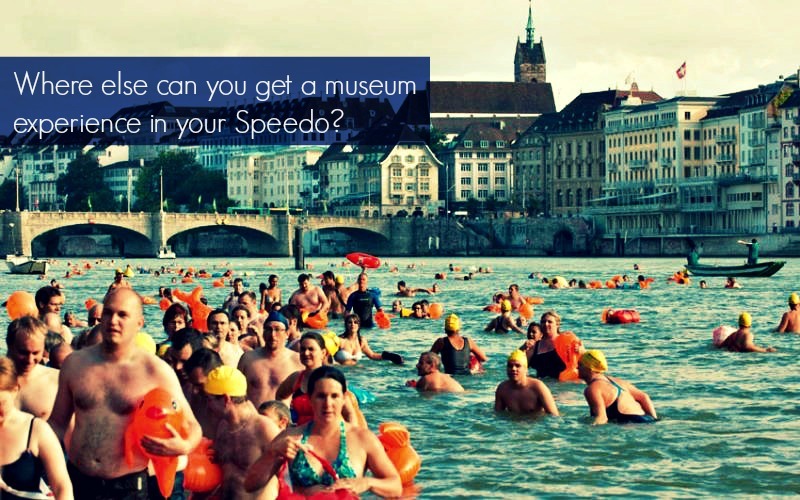 In the summer, thousands of people swim in the Rhine each day (some even use it to commute to work!). Residents come down daily to keep cool, and it’s a huge tourist attraction. Not everyone will be interested in a swimsuit-based interpretive experience, but the numbers work in your favor. A physical experience. Most museum tours involve standing, with a bit of sitting or wall-leaning if you’re lucky. I get tired, I get fidgety, and Maslow’s Hierarchy of Needs always comes into my head – usually right after my left foot has fallen asleep – again. But floating in the river? I can’t remember the last time I felt so invigorated. My body was calm and relaxed but my mind was energized and focused. An immersive experience. It’s one thing to learn about the river and all its connections from a classroom or a gallery. It’s quite another to learn about the river while in the river. A grandeur of scope. In museums, we get up close to things, we study them and and we explore the beauty in the minutia. But throw in a river current and you throw out attention to detail. Instead, you have the opportunity to embrace scale and the chance to showcase the bigger picture. A plethora of topics. History! Not-quite-as-old history! River ecology! Architecture! Another style of architecture! Culture! Take your pick. A demand for brevity. The river sets the pace here, not the docent. It only takes 20-30 minutes to float 2 kilometers, so you can’t tell every story. You may not even be able to tell every detail of a single story. Choose wisely. A demand for creativity. The restrictions of time and location are a challenge, but the coolest things often come out of the strictest limitations, don’t you think? 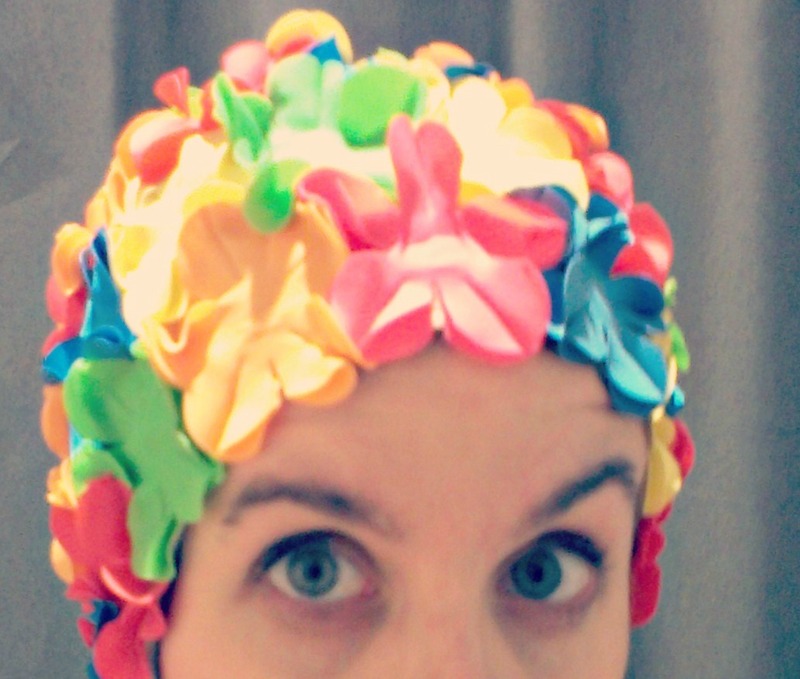 This is not going to be a conventional tour, so throw convention to the wind…er…water and get creative. An element of adventure. Am I the only one who thinks museum experiences can feel too “safe”? Where’s the challenge? Where’s the goal? Where’s the slight suspicion that there may actually be a species of undiscovered river shark and just because you haven’t seen one it doesn’t mean they’re not there? Museum tie-ins. The launching point for most Rhine swimmers is literally the backyard of the Tinguley Museum. You can walk out the exit and into the water. Of the almost-forty museums in the city, many are located on or near the river and even more are connected to it through content. So why not combine the two? Begin in the gallery and end in the water, with a narrative that flows through both. So now the brainstorming begins. How could this be done? Someone in a boat with a megaphone? Water wings with fun facts printed on them? Floating interpretive signs a la Burma Shave? What do you think? Could a tour like this be done? Would you go on one?